Well, I FINALLY got around to ordering my christmas stamps and supplies from the new holiday catalog. 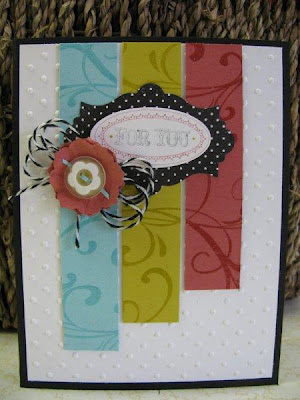 My order came two days ago, so I dove right in and made this card for Nacho Average Challenge 13 and Create With Connie and Mary Color Challenge 220. I made 6 of these to give to my best girlfriends. 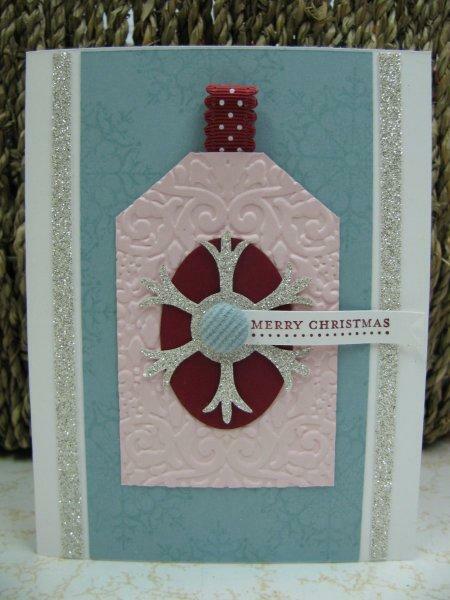 I love these colors together for christmas and the addition of the Pink Pirouette makes it so girly. 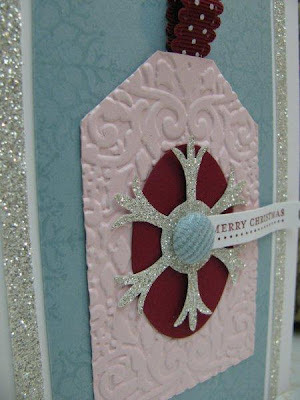 I love, love, love the glittery paper for the snowflakes...it is so eyecatching! 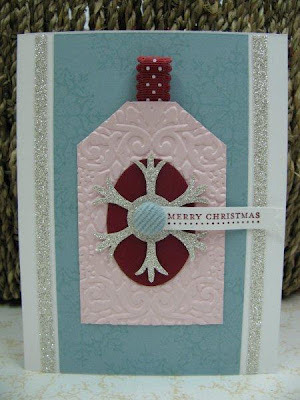 I stamped the Baja Breeze backround piece with one of my new stamp sets called Snowflake Soiree. The snowflakes in this set are so elegant, and paired with the embossed tag (embossed with my new Holiday Frame EF) kicks it up another notch. 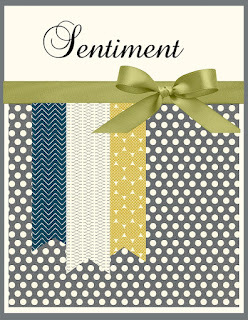 The sentiment is from another of my new sets called Teeny Tiny wishes. Thanks for taking a peek and have a fantastic day! Today's card is for Retro Sketches 30 and CR84FN63. I loved the simple nature of this sketch and was excited to use the color combo with it! My other inspiration for this card was a backround from a game on my iPad called Glass Tower. 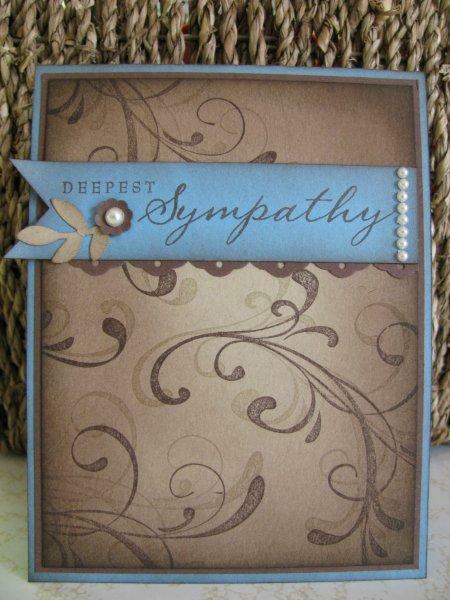 When I saw the brown and tan swirled backround on the game, I knew I wanted to use it sometime on a card. This sketch and color combo happened to be the perfect match for that!!! Thanks for taking a peek and have a wonderful day! Wow, I need to find me some more time to stamp! I am starting some fall adult ed classes in a couple weeks, so that's gonna force me (plus I get paid!) to get some stamping done! This card is for Our Creative Corner Photo Inspiration Challenge and The Paper Players Sketch Challenge 114. 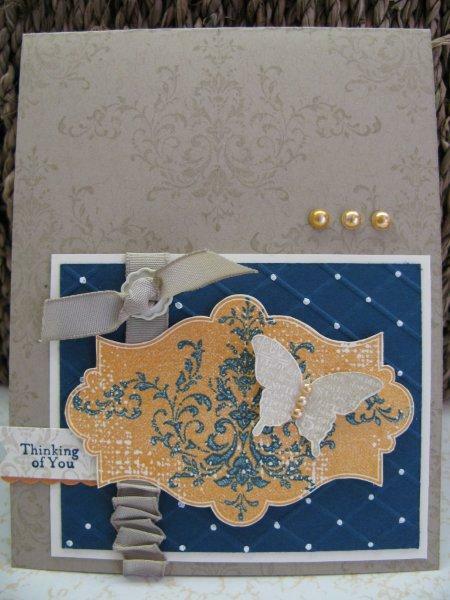 It also qualifies for the Stampin' Royalty Challenge 143 which wants us to use our Big Shot & diecuts. I mainly focused on colors for my inspiration in the OCC challenge. They did ask that we used polkadots and at least 2 buttons somewhere on the project.....I got the polkadots down, but only 1 button. I tried and tried to figure out how to get another button on there, but putting one or more on there just seemed like too much! So, I didn't quite meet the requirements. I really like the end results anyway! 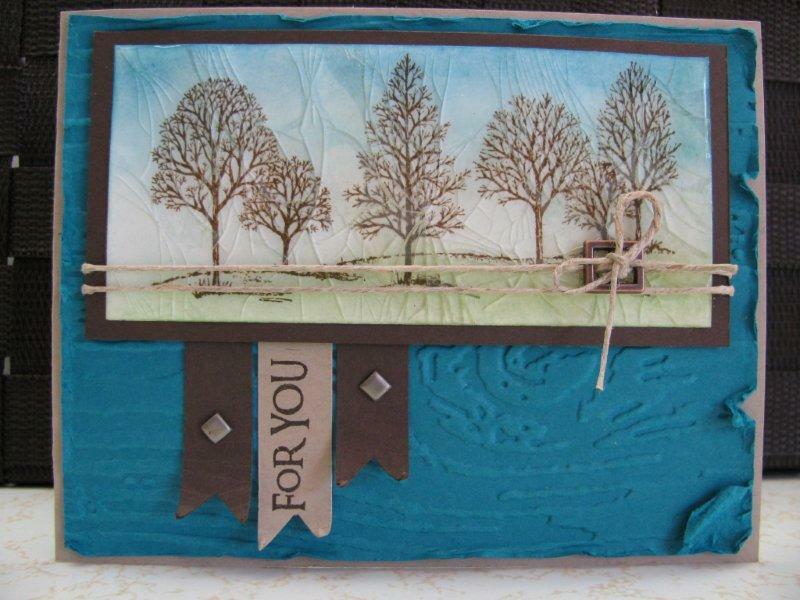 I havn't had a chance to play with The Paper Players for a long time, so I was happy to use this fun sketch. I inked the three stips of cardstock with versamark ink and embossed them with clear EP for a little extra texture and interest. 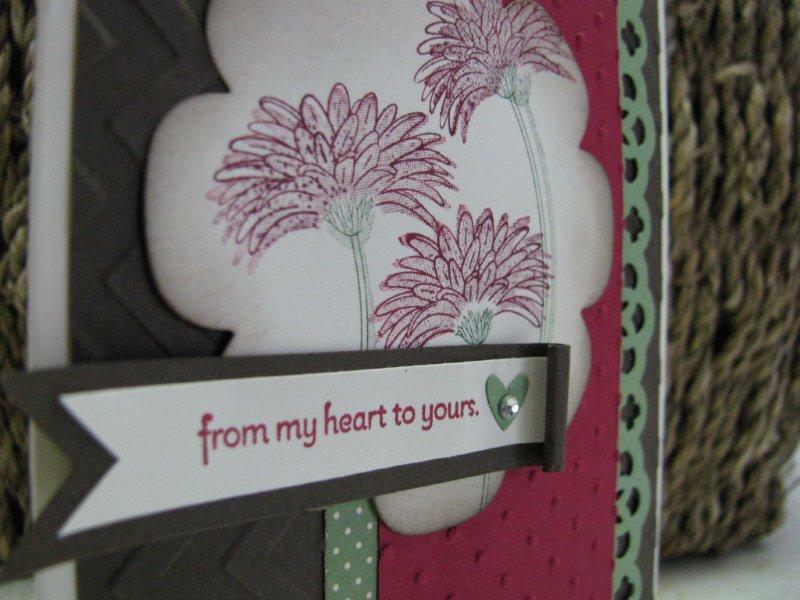 I cut two flowers with the smallest die in the Floral Frames Framelits, crumpled them and layered them together. I cut a small circle of Summer Starfruit and glued it onto the back of the button, so you could see some extra color behind the button. 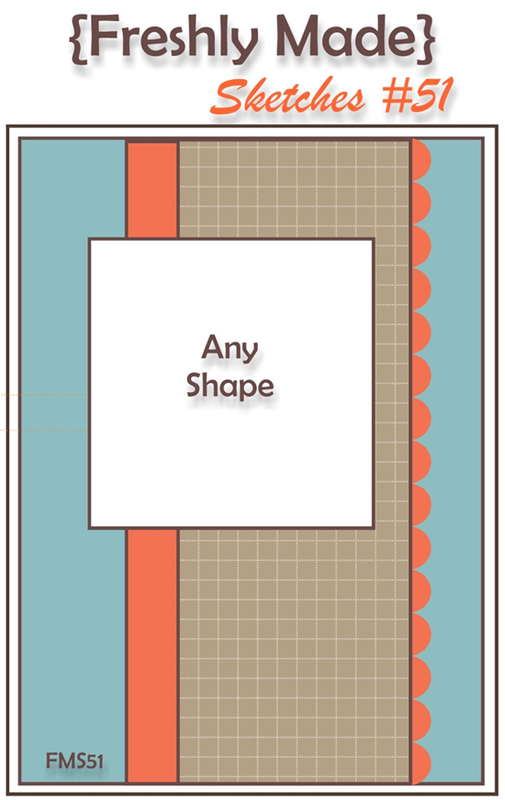 Next, I wove a little snippit of Pool Party through the button to add the third color. 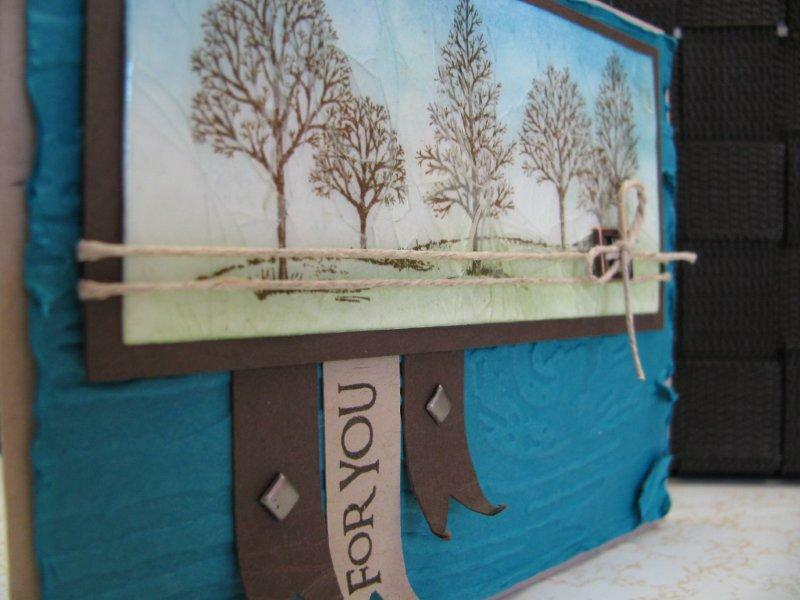 The whole thing is layed on a bow made of bakers twine. Thanks for taking a peek and have a fabulous day! 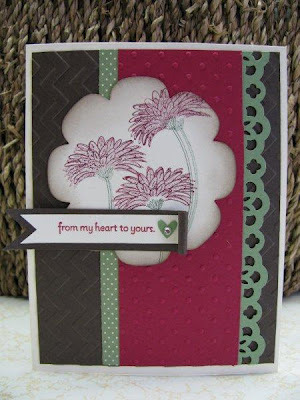 I stumbled upon the Try Stampin' on Tuesday site through another blogger and I loved the sketch, so I decided to take the challenge! 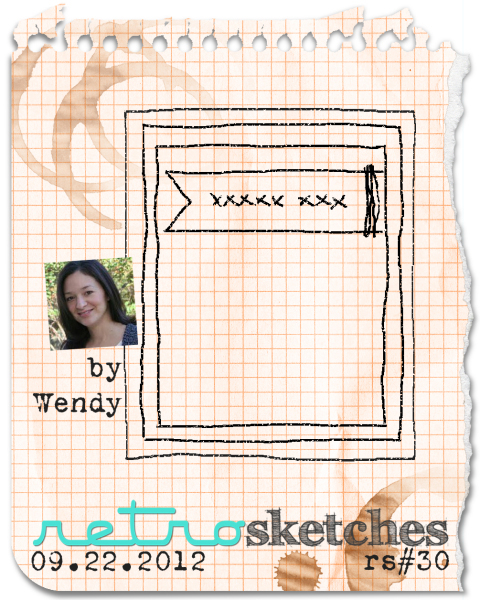 I did tweek the sketch somewhat to fit my card. I had this cracked glass tree main image laying around on my desk...I had intended to use it on another project and never got around to it. Cracked glass is one of my most favorite techniques. 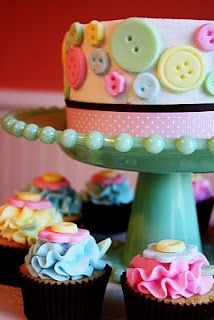 I love, love, love the cracked end result, plus it's so fun to do! It always looks rustic and weathered, so I tried to mimic that in the Island Indigo backround piece by distressing the edges. I also curled up the edges of my banners and added the sentiment and a couple of manly looking brads. The twine string and antique brass embelishment from the Hodgepode Hardware kit also lend a manish feel. Thanks for taking a peek and have a great day! Our Creative Corner Guest Designer! Good morning everyone! Today I'm excited to share the card that I made for a guest designer spot on Our Creative Corner. The Challenge was to use the "kissing techinique" with a twist. The twist is to use an X & O somewhere on your project. I know and love the kissing technique and have used it a few times before. (If you've never tried this technique before, there is a link to a great tutorial on the OCC blog). I did find it very challenging to incorporate an X & O. I sort of did it on the Midnight Muse backround where I used my score tool to make the diamond or "X" patteren. I added the white gel pen dots, which could be the "O". Am I stretching it? 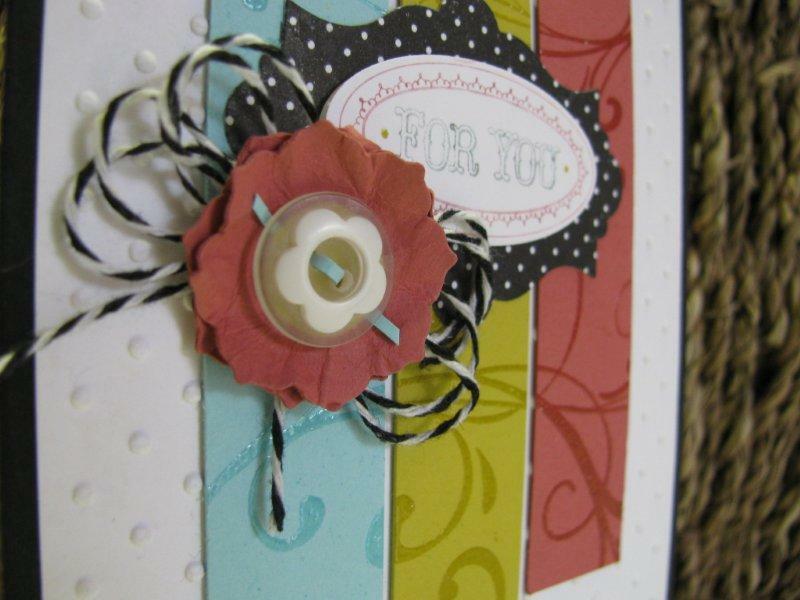 Maybe so, but I am pleased with the way the whole card came out! 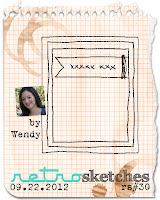 I also used the sketch from Create with Connie and Mary 217 and the color combo from The Play Date Cafe 148. 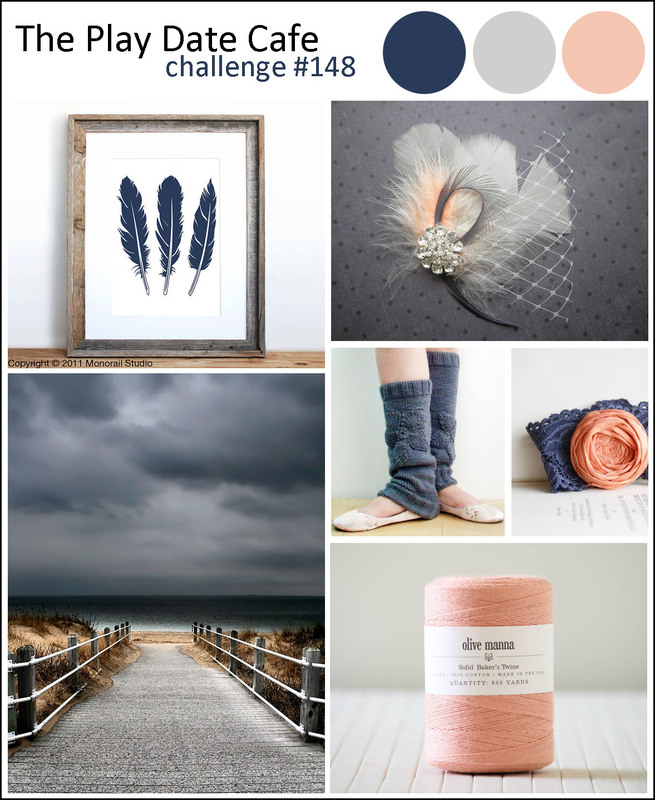 PDCC148 asked us to combine Navy, Peach and Stone. 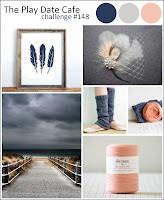 I love Navy color combos...they are always so striking to me. 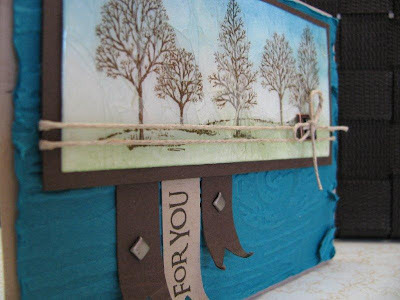 By the way, isn't the stormy beach picture on the PDCC inspiration collage just gorgeous!?!? 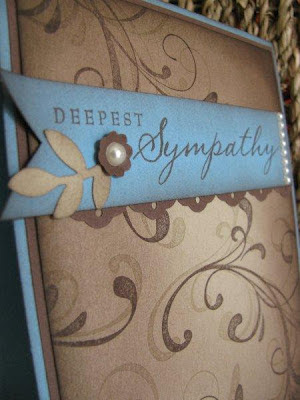 Ok...back to the card. There are just a few details I'd like to share with you. Number one is my love/hate relationship with the gel pen. I love the results that it gives, but I ALWAYS have trouble with the tip gooping up. And then there are the times when the ink doesn't want to come out of the pen at all! Ugh! 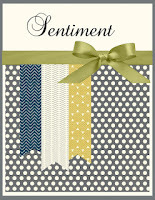 The little sentiment flag was added to cover up a big goopy mistake of white gel pen.....ugh again! I was almost done putting all the white dots on when my pen started to give me trouble and got all gloppy. Darn it! I did not want to start all over and use another piece of Midnight Muse. The solution? Cover it up! It turned out to be a happy mistake, because I love that little tag, but now you know why I love/hate my gel pen. Also, I wanted to add more peach color into the card, so I used my Peach Parfait marker and colored some basic pearls. It was so easy and the end result is lovely! And, the last detail I want to share is the shimmer on the butterfly. 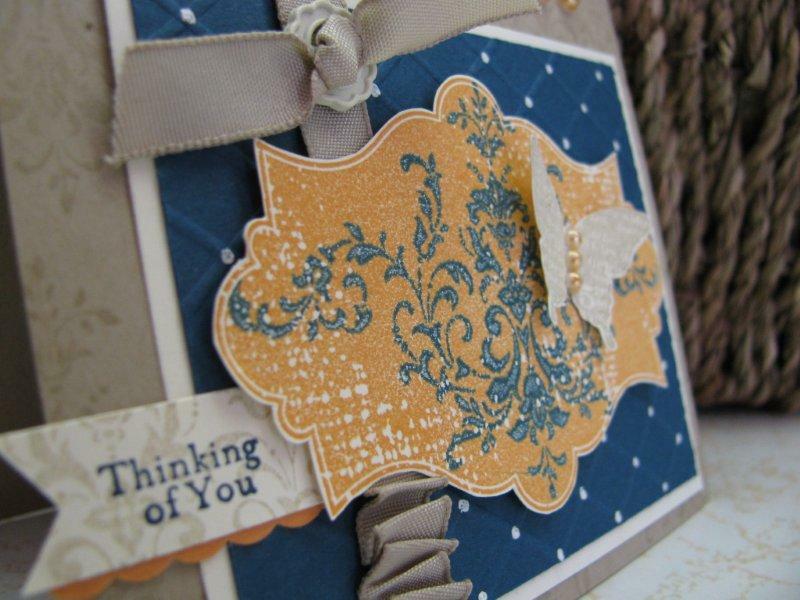 What card doesn't look better with a little sparkle? The shimmer sprayed butterfly gives just a hint of it, but it's a detail that I didn't want to go unnoticed and sometimes it's hard to photograph. Well, well, well....long time, no blog! Boy, I guess it's been a busy couple of weeks for me. I havn't even taken the time to sit down and stamp. School has started, and along with that means schedules and meetings and someone else's timeline. Plus, the end of the summer season approaches, which brings a whole new list of chores to get done before it gets cold. Anyway, enough excuses...lets get down the the business at hand! 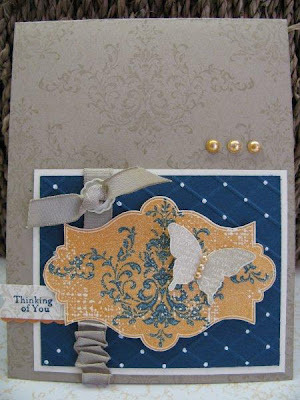 This card combines Freshly Made Sketches 51 & Nacho Average Challenge 10. 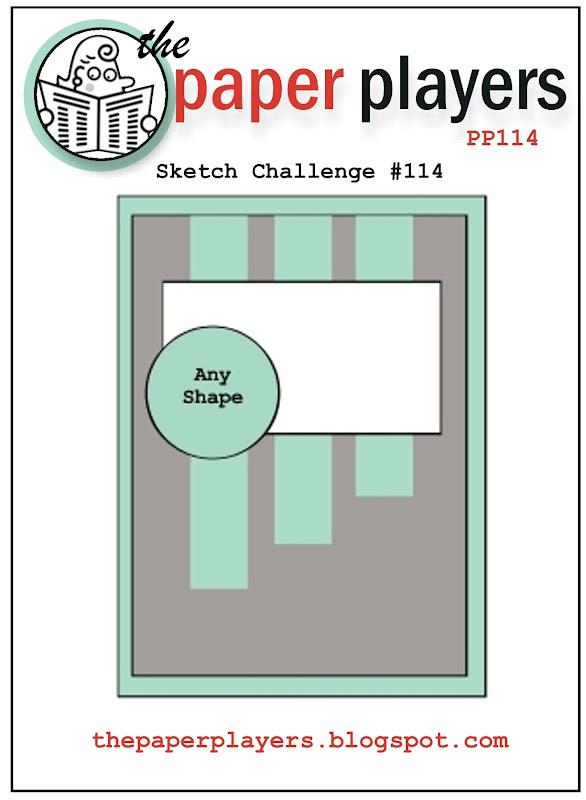 NAC is a fairly new challenge site and they have plenty of good challenge ideas, switching it up between color and sketch, so go check it out and play along!